NYX The Runway Collection eyeshadow "Champagne and Caviar"
Компактная палетка на 10 цветов подойдет для каждодневного дневного макияжа. Тени достаточно пигментированы, хорошо набираются на кисть и растушевываются, держатся без базы или с базов около 7 часов, к концу дня цвет немного тускнеет. Очень приятные и мягкие тени. 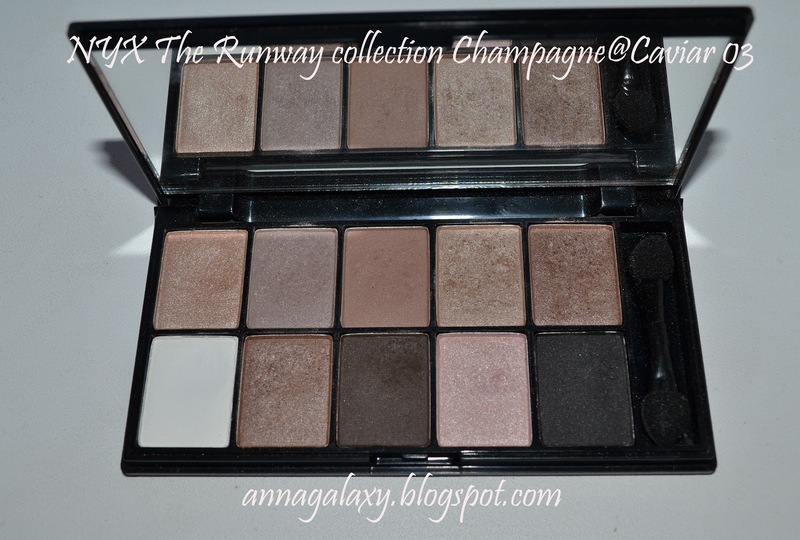 Compact 10 color eyeshadow palette is a good choice for everyday make-up. Eyeshadow in this palette are pigmented enough, well-collected on the brush and blended very well, they stay on your eyes both with eyeshadow base or without about 7 hours but at the end of the day the colors become pale. I can say that these eyeshadow are very nice and soft ones.... I liked this palette very much!